MH Advantage™ is a mortgage loan for manufactured homes that have certain features similar to traditional single-family homes, giving them strong curb appeal so they can fit seamlessly into the community. The benefits of MH Advantage financing include down payments as low as 3%, lower interest rates than most traditional manufactured home loans, and cancellable mortgage insurance that is the industry standard for 30-year fixed rate mortgages. What is the MH Advantage sticker? The MH Advantage sticker—or Mortgage Financing Notice—identifies a manufactured home that is eligible for MH Advantage financing. It is the manufacturer’s notice for homebuyers, lenders, and others involved in the home sale and financing process that the home includes the features consistent with MH Advantage requirements. Where is the MH Advantage sticker located? The sticker is typically applied by the home manufacturer near the HUD Data Plate (a government-required sticker) which is often located on a kitchen sink cabinet door, utility closet door, or a similar discreet location. Does the sticker mean I qualify for MH Advantage? 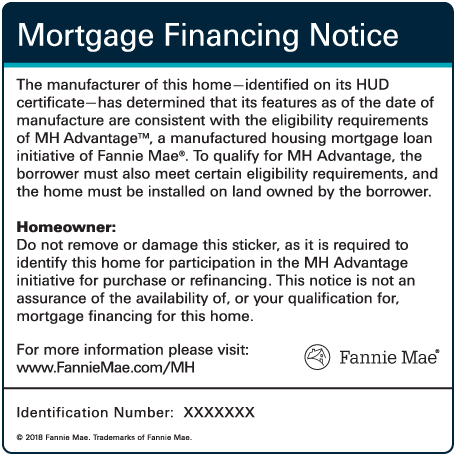 The sticker only indicates the home it is applied to may qualify for MH Advantage financing. The sticker does not mean a particular borrower will qualify for mortgage financing. As a borrower you must meet certain MH Advantage loan eligibility requirements, and the home must be installed on land you own and are using as collateral to secure repayment of the loan. Can I buy and place a home with the MH Advantage sticker on land I do NOT own? Yes you can. However, MH Advantage financing is only an option for manufactured homes placed on land that is owned by the buyer and which is being used as collateral to secure repayment of the loan. Can I remove the MH Advantage sticker? What happens if it is removed or damaged? As the homeowner, you may opt to remove the MH Advantage sticker. But if you do, there may not be other evidence that the home is eligible for MH Advantage financing if your mortgage loan is later refinanced, or if the home is sold. Can the MH Advantage sticker be replaced? No. A removed or damaged MH Advantage sticker cannot be replaced. But when the home is sold or refinanced, a lender may be able to confirm that it previously had a sticker. Make sure to mention the sticker to your real estate agent or mortgage lender. Interested in buying or learning more about a manufactured home? Find a retailer in your area to explore available models.